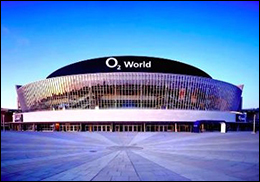 HAMBURG, DE (Hypebot) – Barclaycard has acquired the naming rights to Volkspark's arena, which was formerly called o2 World. From July 1, the 16,000-capacity arena will bear the name Barclaycard Arena after the retail credit services provider agreed a 10-year deal with venue operator AEG Europe. The collaboration, which will also enable contactless payment across the building, sees the Hamburg arena become the third venue to secure a naming-rights partnership with Barclaycard, joining the Barclaycard Arena in Birmingham and Barclaycard Center in Madrid. "We`re giving the Barclaycard brand a face with our arena activities in Hamburg,” added Barclaycard Germany GM Carsten Höltkemeyer. “With over a million visitors a year the arena is one of the world`s 10 most successful event locations. We intend to utilize this potential to raise the awareness of our name among a wider audience."